Navalny brothers Yves Rocher embezzlement case investigation completed | Russian Legal Information Agency (RAPSI). MOSCOW, November 15 (RAPSI) - Opposition leader Alexei Navalny on Friday was officially informed of the conclusion of the investigation into the Yves Rocher embezzlement case, Navalny wrote on his Twitter account. The hearing of the case will begin in February, Navalny said. On November 12, Moscow's Basmanny District Court seized the bank accounts and assets of Oleg Navalny and Alexei Navalny as part of the proceedings in this case. Federal investigators formally charged them with fraud on October 29. The investigators believe that the Navalny brothers had embezzled upwards of 26 million rubles from the cosmetics company, as well as upwards of 4 million rubles from the Multidisciplinary Processing Company by way of a fraud scheme. 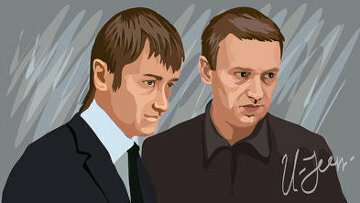 The brothers were further charged with having laundered 21 million rubles. While holding a senior position with Russia's Postal Service, Oleg Navalny is accused of having "manipulated" Yves Rocher into entering into a contractual agreement for cargo mail transportation with the Main Subscription Agency. Investigators found that Alexei Navalny is registered as the founder and the general director of Glavnoye Podpisnoye Agentstvo (Main Subscription Agency), but he has not had anything to do with the company's activity. The enterprise transported mail from August 2008 until May 2011. While the real cost of the transportation amounted to no more than 31 million rubles ($958,414), over 55 million rubles were transferred to the agency's account for transportation services allegedly rendered. Alexey Navalny, 37, a lawyer and an anti-corruption blogger, has risen to become one of the most prominent faces of the Russian opposition movement since the start of mass protest rallies in Moscow in late 2011. He ran for Moscow mayor last month, losing to the Kremlin-backed incumbent, but boosting his public exposure through a vigorous grassroots campaign. He gained just over 27 percent of the vote, well above what initial polls suggested he would get. On appeal in a separate criminal case, Navalny received a suspended sentence earlier this month based on his conviction on charges of timber embezzlement last in July stemming from a stint spent serving as an advisor to Kirov governor Nikita Belykh between May and September 2009. Investigators had alleged that Navalny organized the theft of over 10,000 cubic meters of timber during that period in collusion with Vyatka Timber Company Director Pyotr Ofitserov and Kirovles CEO Vyacheslav Opalyov. He was initially sentenced to five years in a penal colony, and his co-accused Pyotr Ofitserov received a four-year sentence. The two were held liable to pay a one million ruble fine between them. On October 16, however, a court in Russia's Kirov region suspended Navalny's sentence. 16:34 15/11/2013 Opposition leader Alexei Navalny on Friday was officially informed of the conclusion of the investigation into the Yves Rocher embezzlement case, Navalny wrote on his Twitter account.